I don’t know if you can use the term “zoo” but Oatland has created many wildlife habitats along some pretty amazing walking trails. My favorite is the wolves. Man, they are gorgeous and so huge. Oatland also sponsors what they call the Georgia Farm to give some of the local city kids an idea of just how rural Georgia works and sustains itself. Oatland does the Harvest Fest which has become something I look forward to every fall. They do an old fashioned cane grinding to make syrup and even make some of the best apple butter I’ve had since I left the mountains. The whole event is presented in rustic log cabin setting to simulate what coastal Georgia might have felt like back in the mid 1800s. As the day moves on, traditional arts and crafts are shown along with games and even clogging with some old timey music. The Harvest Fest has become a favorite for me for many reasons. First, I grew up in North Georgia and we had something similar called the Sorghum Festival which I volunteered for many times during my junior high days with 4-H. It takes me back. Second, I get a chance to cook over an open fire and be outside for a whole day. Outdoorsy Robby gets way too neglected and this becomes his chance to come back out and roar a bit. Besides, I believe food always tastes better outside. Don’t believe me? Try eating a PBJ on your front porch. I’ll wait. Third, I love anything old and covered in history. The Harvest Fest gives a bit of a peek into the old ways that we are so quickly forgetting. When I see little kids walking around and being impressed with how things “used to be done” I can feel the Big Guy channeling through me and I know why I am a teacher. I love my Xbox 360 dearly but I also love that I know how to cook over a fire. 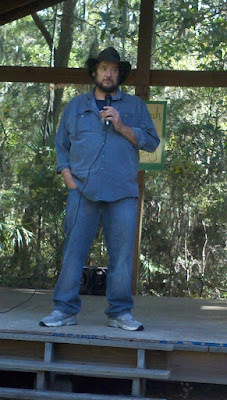 This is Gary Lester from http://openfireforge.com/ This guy’s the real deal when it comes to knowledge about the old timey ways and is the closest person I’ve met to being a true mountain man in the last several years. Gary travels around to perform blacksmithing demonstrations while also teaches open fire cooking. We met a few years ago in one of his classes hosted by Oatland. That was a tasty day. I could just pull up a chair and listen to this guy. Gary’s latest project is restoring an old chuck wagon. It goes without saying that when the Zombie Apocalypse comes, I want Gary on my team. 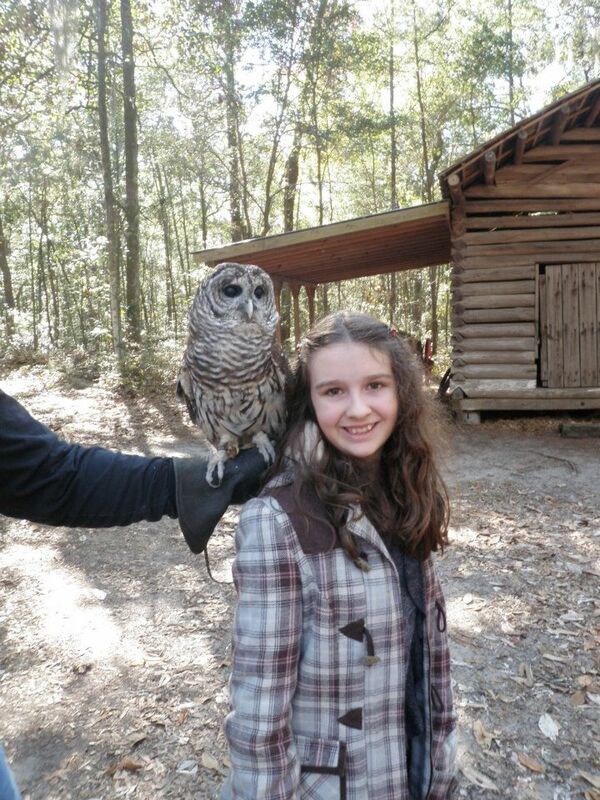 Meet Wah Ho Ho, Oatland’s resident Barred Owl. She was raised from an egg by volunteer, Vint Keener, who is affectionately known as the “Owl Guy” over at Oatland. According to Vint, Wah Ho Ho gets her name from the Cherokee word for “Owl.” Anytime Oatland makes an appearance, you can count on seeing these two and they are always a huge hit with the kids. These are some various shots from the Harvest Fest of our Open Fire Cooking Demonstrations. I’ve always been fascinated by the idea of cooking with a Dutch oven and am quite surprised at many people are into it. It’s like a whole another sub culture not unlike Trekkies and Deadheads though not as scary. I think it appeals to people because we are in this habit of rushing everywhere for work and even play. I believe some people just appreciate the slow pace that comes with Dutch oven cooking. I know that I do. The only other thing I wish I had with me on Saturday was a cigar and some Scotch. As much as I love this, I loved Harvest even more because I got to share it with Kim and the kids. Once again, I realize just how lucky I am because everyone got into the spirit of things and had a blast. Jude practically became an Apprentice blacksmith with Gary. Veronica learned how to build a fire and was my cooking assistant. As usual, Kim jumped right in and helped out where needed. She usually was doing something before I could even ask. I fell in love all over again. Lucky.